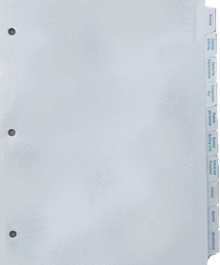 Index Products custom manufactures index tabs to your specifications. Get exactly what you want, when you need it, at a price that will save you money. Why settle for anything less! Index Products is always your best tab source! You describe it, we will quickly make it. Standard or special sizes, 2nd to 31st cut, no problem! Clear mylar, color mylar, no mylar on the tabs... you decide! Black ink, color ink, one side, two sides, edge reinforced, drilled, collated, uncollated, reverse collated, shrink-wrapped... it's up to you! Body copy, perhaps a logo, no problem. Artwork... we'll take it from disk, e-mail, hard copy... however you have it. Typesetting of your tab copy is always provided... in fact, for free! Your artwork is always output to film, on our AGFA imagesetter to provide you with the finest quality image available. REMEMBER: Quality index tabs start with quality imaging of your artwork, there is no better way! Proofs... of course... we always provide proofs. You always have the final opportunity to review, approve or change any specification during the proofing process. Need a million sets, we have the capacity. Need just 20 sets, we have the flexibility! Index Products is the only tab source you will ever need! Do you have a single or an on-going / repeating tab project with an order size of 10,000 or more tabs? Index Products will get the job out on-time, hassle free, saving you money and headaches while still giving you our superior quality index tabs and great service. Try us today... You'll be glad you did! call (888)TABS-NOW, that's toll-free (888) 822-7669. - click here to down-load our "Quote Request / Order Form" in PDF format; next, click here to view instructions on how to use the form to get your quote, or to down-load Acrobat Reader. - click here for our "On-Line Custom Tab Quote Request Form"
- click here for our "On-Line Custom Tab Order Form"
- click here for our "On-Line Blank Tab Order Form". If you decide calling is right for you, here's what to do. Call us toll-free at (888) TABS-NOW, that's (888) 822-7669 and simply refer to the quote you previously received. If you have not received a quote, please click here. 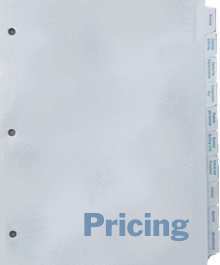 The quote is used to clearly and easily communicate both specifications and pricing. Next, you supply the title of each index tab, the sequence of the tabs and the color of mylar laminate you'd like used on each tab. 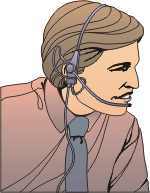 A member of the Index Products Customer Service team will gladly guide you through this process. Once you place the order, we professionally typeset each title at no additional charge. You are then faxed a proof showing the tab layout, bank by bank, as well as all the specifications for your approval or change. On the proof you actually see each bank of custom index tabs. The outline of each tab in the bank is shown with each tab title professionally typeset in any one of thousands of type styles. At the proofing stage, you have the ability to review each element (i.e. the mylar color for each tab, the drill hole size and pattern, whether the holes will be mylar reinforced, whether the sets will be collated, etc.) All the specifications, including the price per set from the original quotation are included on the proof for your review and approval, or change prior to any production. Once you fax back the signed proof approval, standard production time is 3 working days on custom tabs, not including the day of proof approval, and next day on blank tab orders. Rush shipment, as soon as next day, is available at an additional charge.